Although cougar attacks are relatively rare, taking safety precautions when visiting or living in cougar country is recommended. Despite the fact that they can take down a 600-pound moose, cougars (also known as mountain lions or ghost cats) tend to be reclusive, and they prefer not to have any contact with humans if they can help it. Very few people ever have the privilege of seeing one of these beautiful animals in the wild. Cougar attacks are relatively rare. Just 20 people have died due to cougar attacks since 1890, and the majority of these were children and young teenagers. By contrast, 18 people died as a result of dog bites in the U.S. in 2002 alone, and 48,366 suffered fatal transportation-related accidents. There have been 5 fatal cougar attacks in British Columbia over the past 100 years (4 of which took place on Vancouver Island), compared to approximately 3 Canadians killed by bees each year. There have also been 29 non-fatal attacks in the province, two-thirds of which occurred on Vancouver Island. As with fatal attacks, most of the victims were children and teenagers. Overall, humans have been far more lethal to cougars than vice versa. However, those who spend time in cougar country should take certain precautions to make sure that they don’t become one of these rare statistics. Keep children and pets indoors when cougars are at their most active – dawn and dusk. Get a dog – canines not only act as early warning systems; they may also distract mountain lions from attacking people. Don’t leave children unsupervised, have them play in groups rather than alone, and teach them about cougar safety. Ideally, play areas should be fenced in. Use netting or fences to keep deer out, as deer will attract cougars to the yard. Prune vegetation to prevent it from becoming sufficiently dense for cougars to use as cover. Don’t feed wildlife (even birds), as this will attract racoons and mice, which will in turn attract the cougars that prey on them. Also, don’t feed pets outdoors and store garbage securely. Don’t allow pets to roam freely outside. Keep any livestock in barns or enclosed sheds at night, and protect them with fences in the daytime. Be very careful or avoid recreation activities altogether at dawn and dusk when cougars are more active. Bring friends or family along or join a hiking group – don’t go alone. Make noise (i.e., attach a bell to your backpack) so as not to surprise any cougars. Bring bear spray and carry a heavy walking stick that can double as a weapon if need be. Keep children and pets close at all times. Learn what cougar tracks look like and keep an eye out for them. Cougars cover partially eaten kills with leaf litter and soil; stay away from any food caches you discover. Teach children how to behave if they encounter a cougar. Never approach or handle cougar kittens. Don’t attempt to approach an adult cougar, particularly if the cougar is feeding. 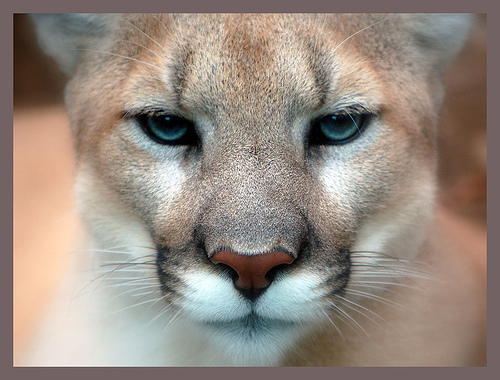 If a cougar behaves in a threatening manner, report it to the nearest wildlife authority such as the Conservation Officer Service (Ministry of Environment) in BC or a state game agency or local wildlife organization in the United States. Stand your ground, make eye contact, and back away very slowly; don’t bend down, crouch, attempt to hide, turn your back, or run, as these behaviours are likely to trigger an attack. In other words, don’t behave like prey. Don’t corner the cougar – make sure that it has enough room to escape. If you have children with you, pick them up but don’t bend down to do so. Speak firmly in a loud, confident voice. Make yourself look larger by raising your arms, opening your jacket, or waving branches or sticks. Make noise – clap your hands. Throw something at the cougar that you have handy, such as a water bottle (but don’t bend down for a stone or other object). Although an attack is unlikely, if the cougar does follow through, fight back aggressively. Many people have managed to drive attacking cougars away using garden tools, fishing rods, rocks, sticks, other handheld items, and even their own fists. If knocked down, get up and stand up if possible, and continue fighting. For more information on cougars and other big cats, see Wild Cats of Canada – Bobcat, Lynx, and Cougar. Bekoff, Marc, & Blessley Lowe, Cara (Eds.). (2007). Listening to Cougar . Boulder, CO: University Press of Colorado.